Preparation time: 10 minutes. Cooking time: approximately 15 minutes. Chilling time: 30 minutes. Preheat grill to medium heat. Lightly spray both sides of fish fillets with olive oil cooking spray. Combine garlic salt, onion powder, paprika, and lemon pepper in a small bowl and stir to mix well. Sprinkle seasoning mixture evenly onto both sides of fish fillets. 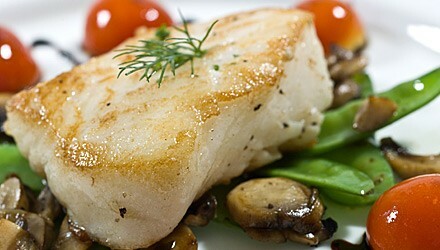 Refrigerate seasoned fillets for 30 minutes to allow flavor to penetrate fish. Right before grilling, heat margarine, garlic, and parsley in a saucepan over medium heat. Remove from heat when margarine is melted and cover to keep warm. Coat grill rack or grill basket with cooking spray. Grill fish for 4–6 minutes per side, or until fish flakes easily with a fork. Stir margarine mixture and drizzle over fish. Serving size: 4 ounces fish. Exchanges per serving: 3 very lean meat, 1/2 fat.